This winter and spring flowering lily grows in abundance in the rocky bushland of the Sydney region from Wollongong to Port Stephens. 'Gymea' is its Aboriginal name. At least three other studies of the Gymea lily (Doryanthes excelsa) by Lewin are known - two in the Mitchell Library (State Library of NSW) and another offered at auction by Christie's, London 26 September 2002 (67). In his book 'A narrative of a visit to the Australian colonies' (London, 1843), the visiting English Quaker and missionary James Backhouse noted that Australian Aborigines roasted and ate the lily's stem. Signed and dated l.r., pen and black ink "I.W. Lewin .../ 1810.". Art Gallery of New South Wales picturebook , Sydney, 1972, 65 (colour illus.). Tim Bonyhady, The colonial image: Australian painting 1800-1880 , Canberra, 1987, 13 (colour illus.). Christie's London, Christie's London: Exploration and travel including The Bligh Relics , St. James's, 26 Sep 2002, 66 (colour illus.). lot no. 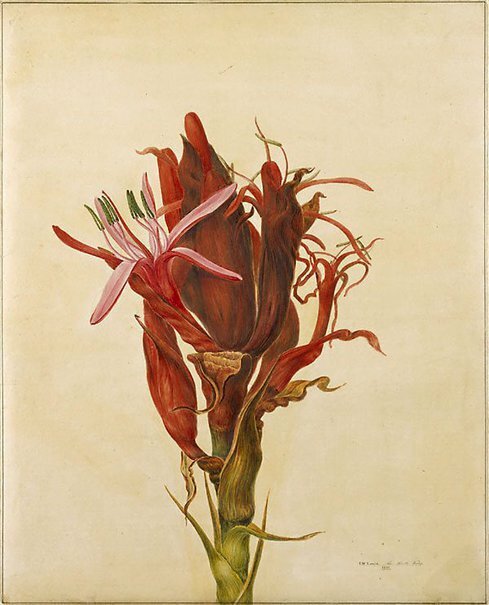 67 is a watercolour on paper titled 'The Gymea Lily (Doryanthes excelsa)', painted in 1807 by J.W. Lewin, 54.6 x 41.3 cm, Estimate: US$47,000 - 78,000. Bruce James, Art Gallery of New South Wales handbook , 'Australian Collection: Works on Paper', pg. 182-197, Sydney, 1999, 183 (colour illus.). Jennifer Jones-O'Neill, Capturing flora: 300 years of Australian botanical art , 'Curious cones and gigantic lyllies: early encounters with the Australian flora', pg. 29-78, Ballarat, 2012, 60, 64, 65 (colour illus.). 19th century Australian watercolours, drawing and pastels from the Gallery's collection , Sydney, 2005, 20, 21 (colour illus.). Art Gallery of New South Wales Quarterly , Sydney, Apr 1969, 454, 456 (illus.). Anne Ryan, Australian art: in the Art Gallery of New South Wales , 'Colonial eyes', pg. 17-18, Sydney, 2000, 17, 20 (colour illus. ), 21, 301. Daniel Thomas, Creating Australia: 200 years of art 1788-1988 , 'Colonial Art: Nature', pg.32, Melbourne, 1988, 35 (colour illus. ).